Having a mudroom in the home means it is one of the most walked-through and busiest rooms of the house. They tend to be the catch all area for the family and guests either coming or going. They are a place for hanging up coats and jackets, as well as keeping smaller, everyday items like keys and mail. Mudrooms tend to be the most unorganized and cluttered places in the house. Adding organization by using simple storage solutions will make this room a more functional area of the home. cabinets, and dressers. Place storage baskets on the shelves of a bookcase for easy to grab everyday items. Utilize the drawers of the dresser for storing winter jackets and sweaters. By reusing old furniture, you’re not only helping the environment but also helping out your pocketbook! Every mudroom needs a place to sit to remove shoes or place grocery bags. Instead of a plain bench, get one that will provide extra storage. A storage bench isperfect for storing sports gear, shoes, throw blankets, or other items you would keep in the mudroom. Mudroom benches come in a variety of styles and sizes and it should be pretty easy to find one to fit your mudroom. 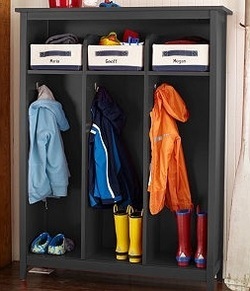 Adding cubbies to a mudroom is a great way to keep things neat and organized. Each family member can have their own cubby to place their hats, bags, gloves, and purses. Cubbies can be a real space saver especially in a small room of the house, like the mudroom. They aren’t too deep, which save floor space, and can go vertical using up a lot of wall space for storage. Coat hooks are another option for the mudroom especially if the mudroom is really small and not able to accommodate the use of cubbies or other mudroom furniture. These hooks can be used for coats, purses, hats, and backpacks (just to name a few). Add two or three rows and columns of hooks to create more places for things to hang. Start a row of hooks about 30” inches off the ground and then start another row 36” inches higher from there. Soon you will have a wall that will be a mosiac of coats, hats, bacpacks, scarves and more creating a unique and organized mudroom. Those fortunate to have a mudroom know how valuable this space can be. Dedicated to housing shoes, jackets, cleaning supplies, and other household items, a mudroom helps contain clutter that could otherwise end up throughout the house. However, failure to organize this important space can lead to a huge mess. Specially designed storage furniture can help avoid chaos in a mudroom. A mudroom locker, equipped with hooks, shelves, and drawers to store a variety of materials, is one example of this type of furniture. The first step in choosing mudroom furniture is to determine what it must store. It is important to consider how many hooks, shelves, and cupboards will be necessary to properly organize all objects that will inhabit that space. Some families may choose to have a separate locker section for each individual. This provides a personal place to deposit jackets, shoes, hats, school supplies, and many other objects. Pieces of furniture with multiple locker sections are available for these families. Additionally, it is possible to buy single lockers and combine them for a custom look that will accommodate all family members. In addition to storing outer apparel, these lockers can also be utilized as a storage space for cleaning supplies, linens, pantry items, or even outdoor toys. Shoppers looking to store those materials may look for spacious drawers or baskets, which are found in many lockers. After determining what will be stored, it is important to look at the surrounding decor. Furniture for the mudroom is available in many different styles, colors, and materials. Those looking for a traditional look may opt for one of the many wooden styles available. The variety of available wood tones and colors ensures this new furniture can match existing cabinetry. In addition to the classic wooden styles, more modern designs are also available. Lockers with clean, simple lines blend seamlessly with more contemporary interior designs. Metallic school-style lockers are available in a variety of bold colors, as well. These lockers provide a sturdy option that is sure to stand up to hard use. Customers should also consider whether they would prefer a model with or without doors. Many like to use doors to the hide mess away. However, an open style encourages residents and visitors to deposit jackets in the lockers while passing through the mudroom. Whether seeking to furnish an existing mudroom or carve out a new storage space, mudroom lockers are a fantastic solution. A wide variety of styles and designs ensure that any customer can find the right mudroom furniture to meet their needs.